We'll Get Your Vehicle Back on the Road Quickly! Whether your European vehicle needs routine service or emergency repair, you can trust our team of experts. We're a local family-owned business since 2001. 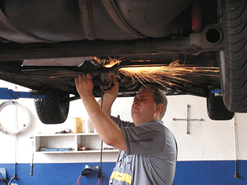 We are a CERTIFIED Auto repair center & an ASE-certified & emissions certified shop with old-fashioned values. Like honesty and integrity. We cater to our customers. With services like 24-hour towing, synthetic oil changes, tune-ups, brakes, transmissions, engines,electrical issues and our specialty- Check Engine light repairs. You name it we can do it, you can count on us - wherever and whenever your car, SUV or truck needs help. We are your alternative to the high cost dealer shops, we offer reasonable rates- guaranteed. We specializie in repairs for BMW, VW, Audi, Volvo, Mercedes- Benz, Saab, & Mini. We also provide services for ALL makes & models of cars & trucks. Scheduled maintenance, A/C repair, & also electrical a specialty! Check Engine light repairs- Free Scan! Your Dealership alternative to their high prices & maintain your warranties, no worries. ​ We provide a variety of services listed below. We are committed to ...identifying our customers' changing needs by offering effective, economic and innovative solutions...the application of modern technologies ...striving for continued excellence and honesty...to deliver responsive service and unmatched reliability...to offer superior products from the finest brand names at very competitive prices ...being responsible for our actions and treating each customer with courtesy. I was skeptical regarding their ability to do good car repair work. I brought my BMW in on a Monday, by Wednesday the work was done. When I picked it up, it was done right and to my satisfaction and believe me I'm very hard please. These guys stand behind their word.